Tehran- The Iranian Revolutionary Guard Corps was giddy with anticipation today as they waited for Iran’s Supreme Leader to unveil their newest weapon system to the public. 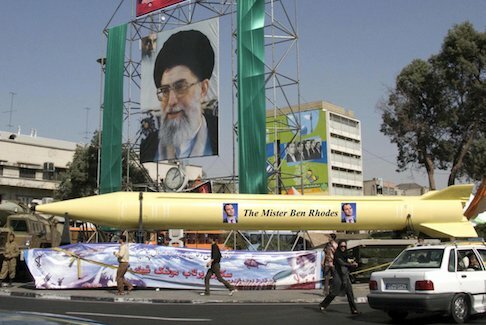 As crowds waited at the bi-weekly “Death to America/Death to Israel Military Parade and Children’s Puppet Show”, the Ayatollah Khameini removed a giant tarp to reveal Iran’s newest missile: the “Ben Rhodes”. Named in honor of the most clever former aspiring novelist to ever serve as a National Security Advisor to Barack Obama, the “Ben Rhodes” is an impressive weapon indeed. The Ayatollah Khameini explained the reasoning behind the name to the press.